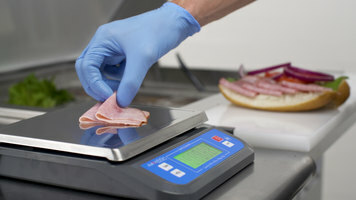 Use AvaWeigh scales to ensure fast and reliable portioning at your deli, commercial kitchen, or bakery. With such a small footprint, these scales won’t take up valuable counter space in your busy kitchen. Made for commercial use, each scale has a durable plastic body and a stainless steel platform. The platform is removable for easy cleaning and has beveled edges to contain any accidental spills. Easily read each measurement on a large LCD display. These scales are powered by an AC adapter, but you can also use batteries when on the go. To conserve power, each scale has a shut-off feature after 5 minutes of inactivity. AvaWeigh offers both portion scales and legal for trade scales. Portion scales are ideal for measuring ingredients like flour and sugar in your commercial kitchen. The over-sized platforms are also great for measuring deli meats for sandwiches, or weighing large cuts of meat. With only 3-keys needed for operation, any staff member can use these scales with ease. The legal for trade scales are better for measuring precise portions meant for resale. They are designed to stand up under daily, heavy-duty use. These scales are perfect for weighing products like coffee beans, lunch meats, pasta salads, and other premade food. 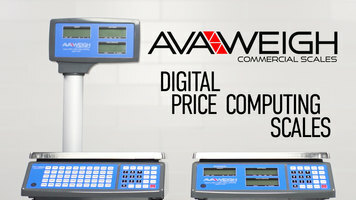 Avamix legal for trade scales are available with or without a towered display, making it easy for both you and your customers to see the weight and price. With a 25-key keyboard, these scales can memorize item names, tare weights, and prices! They have the capacity to store up to 265 PLUs to ensure quick measuring. The scaled can also be connected to a printer with a RS232 interface or USB port. Save time and money by using an AvaWeigh scale to get fast, accurate measurements. 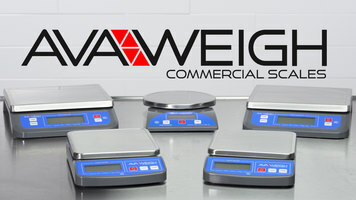 AvaWeigh scales are great for fast and reliable portioning at your deli, commercial kitchen, or bakery. Check out this video to see the features that make Avaweigh scales a great addition to your food service operation! Portion control scales help make sure your staff is using just the right amount of meat, spices, or even coffee beans. Start a portion control program in your kitchen so that you can serve customers with confidence and your business can stop losing money. Have complete confidence in the portion control at your restaurant or deli with an Avaweigh legal for trade scale! See the many features you get when using these accurate scales in your business. Whether you're weighing leafy greens or bulky meats, a consistent, reliable portion control scale is a must-have for any cost-conscious business! Avaweigh portion control scales are built for the commercial environment, with a removable, stainless steel platform, a variety of features to help keep up with your busy schedule, and a fast, accurate display.